My First Christmas Bauble – celebrate your little ones first Christmas with this beautifully decorated roof top Santa bauble, it can be personalized with your own special message on the reverse. 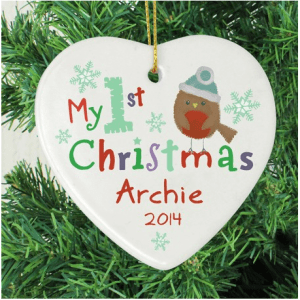 My First Christmas Ceramic Heart – decorate your tree or mantelpiece with this lovely ceramic heart, add the name & year of your choice for no extra cost. 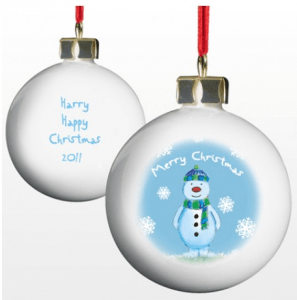 Personalised Snowman Bauble – so it’s not your first Christmas, well that’s OK because we can help you make a delightful new addition to your tree with this charming snowman bauble that can be personalized with your own message on the reverse. 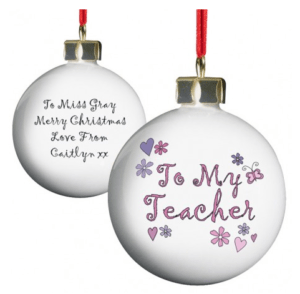 To My Teacher Bauble – a perfect gift for a special teacher this Christmas. 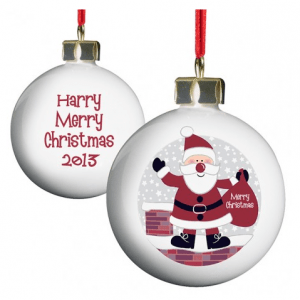 This delicately decorated bauble can be personalized with the message of your choice. 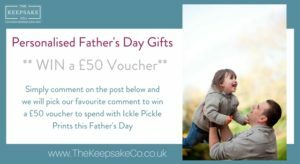 Father Christmas Wooden Star Decoration – personalized with your own festive message this lovely wooden star will look fabulous hanging from any Christmas tree this year. What’s your traditional Christmas look like?